Travel with Kevin and Ruth! : Best campsite yet! We are almost finished our three and a half week camping safari tour of Namibia and arrived at our last scheduled campsite yesterday. And they saved the best till the last! We have purposely not been showing you much of the resorts at the last two campgrounds because we'll be returning to them to stay at their lodges in December. But they are super interesting places, so stay tuned! Yesterday, we did a really boring 400 km (250 mile) drive from Fish River Canyon to the Kalahari Anib Lodge Resort. It was so boring that we picked up a hitchhiker to liven things up! 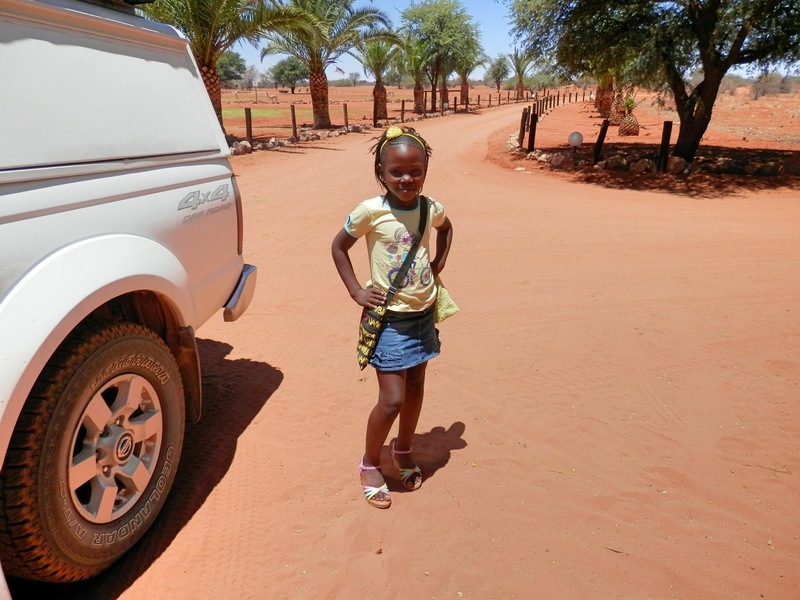 Hitchhiking is very common in this part of Namibia because of the long vast stretches of nothingness. In fact, if you have an empty seat it's almost frowned upon NOT to stop and pick someone up. So when we saw a nicely dressed young man with a couple of travel bags, we stopped. We think his name was Malvin, we're not sure. But he was a nice young guy, a student who goes to agriculture school and heads home to his parents on weekends. He says that there is a bus that comes by but you never know when it might show up, and he says he never has a problem hitching a ride. He was really quiet, and we had a difficult time understanding his English. But we felt good about giving him a lift. After we dropped him off, we stopped to pick up a young woman, but she needed a ride further than where we were going and she thought she would have a better chance waiting where she was than where we were going to be turning off. This is Nevelene, and she is 8 years old! Nevelene's mother works here at the lodge and she needed a lift from the gatehouse. We were happy to oblige! 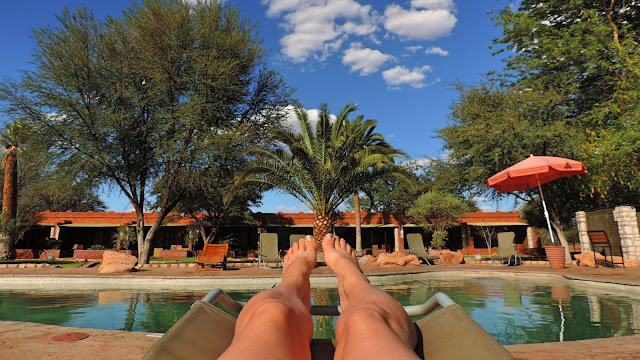 Kalahari Anib Lodge has only three campsites. They call them "exclusive" and they really are! We were greeted by reception with a cold glass of fruit juice and Monika gave us a tour of the place after we checked in. Then we went and got set up at our site before returning to relax. Our nearest camping neighbor is around 100 yards away! Our campsite has a shaded paved patio with a nice picnic table and three sided brick braai. Also, our own private toilet and shower! Very nice! And better yet, as campers we are allowed to use all of the amenities of the resort. Ruth, taking advantage of some relax time! We were sitting having dinner when we saw some movement in the grass. I grabbed the camera and got this yellow mongoose with a snarly look on his face! We watched him come and go a few times. He was pretty shy though and didn't want anything to do with us. Our second last night camping. So while we've had a GREAT camping trip, we are looking forward to our month of December. We'll be stepping up our accommodation a notch as we explore all of the Namibia lodges in the Gondwana Collection! The "relax time" is getting closer to my idea of travel. Then to clinch the idea, you mentioned the sleeping in a tent thing. Been there, done that. No interest. Thats a long time to be sleeping in a tent, but looks like you did enjoy touring the country. You survived the tenting month! Looks like a fabulous camping spot. We have had some folks over the years camping in similar units as yours here on the beach. Looking forward to the next leg of your adventure. Looks like a great campsite! I like the idea of hitchhiking, too bad those days are over in this country. Love your pictures! I thought mongoose were vicious animals. Guess I need to educate myself better. There is no way I could have tent camped even above the ground. I remember my Dad picking up hitchhikers especially soldiers when I was young. And I used to hitchhike through Yellowstone Park when I worked there. But no longer. That campsite is like saving the frosting on the cupcake for last! It's all good but what an ending - beautiful. Looks like you're getting in some good relaxation too. Enjoy it! In the lodges, will you be able to cook your own food? Maybe you are going to splurge! Kevin, the ONLY way to improve your pics is either have an animal or Ruth in it !!! Are their any 'ROCKS' in that country or is it ALL MUDSTONE ??? I always thought THE RIFT VALLEY was the deepest canyon in Africa !!! I have 'hitched' ALL OVER the U.S., back in the 50s, when it was 'sorta' safe, but haven't tried it lately... I was usually 'armed' even back then !!! Thanks, for the ride, b'wana Kevin !!! Evidently they are a trusting people, to let their children hitch-hike !! !